Minnie writes me about the tragic deaths of Seaton family members, expresses regret for not having studied nursing, and hopes the quarantine will be lifted soon. I am writing this letter sitting in porch swing on front porch. It’s lots nicer down here than up there in my room. It seems so warm tonight and up there I feel so off by myself and lonely. It’s clouding over in the north and west so I wouldn’t be surprised if we would have a rain soon. Everybody needs it but the boys in camp. Sunday was rather a sad day at home. [My sister] Bertha had a letter from [her husband] Charlie [Scholer] Saturday and it was written on Tuesday. In it he said Mr. [Roy] Seaton and the little boy had influenza and Mr. Seaton said he was taking it that night when he left the office. But Charlie said Mrs. Seaton was getting better. Saturday morning the telegram came to Manhattan that Mrs. Seaton and one of the twin babies died Friday evening. Bertha feels awfully bad about it. That was the happiest family and Mr. Seaton nearly worshipped her. She was the only woman Bertha knew in Washington [D. C.]. We’ve known Perry Seaton ever since we came to Manhattan, and Charlie [Scholer] and Capt. Seaton are the best of friends. Rev. Jacobsen said it was one of the saddest things he ever knew of. I suppose Mrs. Perry will take little Jimmie and the twin if it lives. Mr. Seaton has been planning on going to France soon. Charlie has thought some of going. They would just go to look around [and] see the shells they are using, etc. I don’t really know exactly. Charlie said he couldn’t write us very much about his work. They have to be careful [what they say]. He says he sure likes his work there. I read in today’s [Topeka] Capitol that they were greatly in need of Red Cross nurses in France. I’m so mad at myself. I wish I had gone into the Charlotte Swift Hospital when I finished the two year high school on College Hill. Bertha and I were talking to one of Bertha’s friends Saturday. She has been in the hospital up there and Saturday she sent her papers to Washington [D.C.]. She says she expects to go across [to Europe] soon. I would give anything to be in her place. She has been training for about three years. What are you doing, Ward, with all these letters I’m sending you? Surely you are not trying to keep them. You would be loaded down with them. I wish I knew some interesting news from College Hill, but I don’t. I tried to call Kate but I didn’t get her. I expected to go over to see Stella [Munger] but didn’t so I haven’t talked to anyone except your mother from over there. All I know is that Mr. Hays is going to have a sale – and the Red Cross is going to serve dinners – they are expecting about 300 people [and are] going to charge 50 cents a plate. The folks are all going over. The teacher at Blue Bottom seems like a real nice girl. She’s young but [my brother] Wayne thinks they have a fine school. She and I are the same age. She’ll be twenty in November but she’s lots taller than I and has more sense, I guess. School is going fine as far as I know. I know we seem to be getting along up here alright and Mrs. Parkerson told me last night that James (her grandson) likes his teacher awfully well. And she said she hadn’t heard anyone in district complain. They all seem to be satisfied. I hope they will continue to be. Mama said Stella was liked real well out at Deep Creek [where she teaches]. I’m sure glad. I hope we girls can be successful all three of our terms. Everybody laughed so at “Those Kids” trying to teach. I believe I can have a two week vacation at Christmas but don’t know yet whether I’ll want it or not. If I go to College spring term I won’t because my school will let out just in time if I have one week vacation. We are going to have a social of some kind between Thanksgiving and Xmas. If we make enough money, we are going to buy a school Edison. I thought by what you said in a letter a couple of weeks ago that you wouldn’t be able to send letters if you were put under quarantine. Then the last letter was written after you were under quarantine. So I decided you could. Then today I didn’t get a letter from you, so I believe now you can’t. I believe so many things now days that I’m not quite sure what I do think anymore. I have it all fixed up now, that if the quarantine is lifted toward last of this week, you’ll get a weekend pass. If lifted the first of a week, you will probably be moved before the last of the week. If you don’t get home some weekend before you are moved, and if they take you away from Camp Funston to a camp in some other state, I wish you could come home some evening during the week. And the folks come up for me at 4 o’clock and bring me back next morning. But I don’t suppose they would let you go if you were likely to be moved soon. I have time to hatch up all kinds of schemes, but they are all fakes. I do hope and pray tho that you will get to spend a weekend at home soon. Why boy, just think when I go home this next Friday evening – only four days away – your mother may have a letter from you saying you are coming home. Or Saturday sometime you may call home saying you sure have a pass from 6 o’clock Sunday morning till 6 o’clock Monday morning. Oh Glory, boy, you would never, never know how happy I would be. That day, Ward, I believe will be the happiest one I’ve ever experienced. But there’s one day that will be far happier [and] that will be the day you come back to stay. There’s never a night but what I lie awake thinking of that time. It seems like a far off dream, but doesn’t it seem grand, darling, to think that that time is really coming some time. This war can’t last always. In some ways it seems that being with you the way I used to be is just a dream. It seems so long ago. It’s lightning and thundering real hard in the west. I hope we get the rain here and not you boys over there. Roy A. Seaton was a professor of Mechanical Engineering at KSAC . He resided at 722 Humboldt Street in Manhattan. Roy’s wife and both of his twin infants died in the influenza epidemic in 1918 while staying with his brother, Perry Seaton, in Washington D. C. The bodies of Mrs. Seaton and the two infant twins were returned to Manhattan for burial (see Minnie’s letter of October 11, 1918 to follow). By 1920, Roy’s parents, Oren and Sadie Seaton, had relocated to Manhattan from the East to help Roy raise “little Jimmy” Seaton. Seaton Hall on the KSU campus is named in honor of Roy Seaton. Dr. B. Belle Little was born in Manhattan and after finishing the public school course at Manhattan entered the Kansas State Agricultural College, where she graduated with a Bachelor of Science in 1891. In 1906 she obtained her M. D. degree from the Woman's Medical College of Pennsylvania at Philadelphia. In September, 1907, after a year spent as intern in the New England Hospital for Women and Children at Boston, she began her active practice at Manhattan associated with her father, a pioneer practitioner in Kansas. In honor of her mother, Charlotte Swift, Dr. Little founded the Charlotte Swift Memorial Hospital at Manhattan, which was opened March 2, 1915. Charley Scholer, an engineering graduate of KSAC, worked for the War Department late in 1918. Though his actvities were considered top secret at the time, it is believed by family members that he and other engineers were expected to study the heavy artilley and munitions of the French in order to ramp up production of the same in the U.S. I write Minnie more news about the quarantine and let her know her daily letters help me keep my sanity. It sure seems good to be able to write with a pen again & I expect you are glad to read it instead of a dirty old pencil letter. I just got a package from Mother containing my pen & leggings. I just came away from the Canteen where the only phone we can use is placed. I put in a call for you but the place closes up at 3 o’clock & I had to leave without getting connections. The phone in the “Y” can’t be used now because the building is nearly full of cots for Spanish Influenza patients. The Canteen is quarantined also but they let men use the phone. I used to think I had an awful time trying to get you over the phone on other Sunday afternoons before but this takes the cake. I expect you are at Sunday school about this time. I wish I could walk home with you because it is a very beautiful [day] here at any rate. I expect a rain is gathering tho. I do hope it doesn’t rain & get cold because the men will die like flies because this influenza will turn into pneumonia if a man doesn’t receive good care. This camp I believe holds the record for the least number of cases but there are plenty of them here. If the weather stays favorable, I think it will run its course in about a week tho. You should see the hill back of camp today. It looks like one great huge patchwork quilt because every man had to take his bed clothes up & spread them out in the sun. I would like to take a picture of it. I can look into the next tent & see a crap game in progress. I am glad I had a good mother and that a good girl is waiting for me to return for then I can enjoy writing to them much better than to shoot craps. I heard that there was to be a picture show outside of the “Y” last night so I went down hoping to see it, but I suppose they didn’t have it because it would call a crowd & we must by all means avoid crowds. I sure would like to see a good picture show once more. My sakes but wouldn’t I like to hitch up old Bob & rattle around the end of Old Bluemont [Hill] again. We are scheduled for a parade this afternoon but they called it off. I don’t see how they could be so kind. 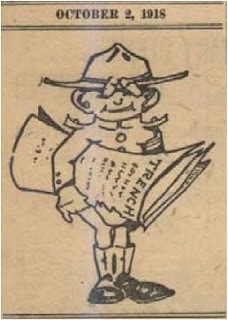 I am going to enclose an article I saw in the “Trench & Camp” – a paper gotten out at Camp Funston. Only a soldier can appreciate it fully tho. Today seems different from any Sunday I have spent here. Not a soul to be seen around the hostess house. For some reason or other, I don’t feel very bad about it. I was afraid I would feel like I did last Sunday but I am beginning to look at things philosophically, I guess. Of course I don’t like it but I try to think of other things instead of sitting around wishing I was where I wasn’t. You must be making a grand success as a school teacher. I just knew you would. You must not like it so well that you won’t want to go to college tho. The boy in our tent who is married got a pass last night to go to Manhattan. He telegraphed his wife to meet him there. I am sure glad he got it because he was awful homesick. His wife made it worse tho because she would keep begging him to come home instead of writing cheery letters that would brighten him up. I wouldn’t be surprised but what he will be worse than ever after his pass. I am afraid I might be if I were in his place. Every time I get disappointed about a pass I think, “Well when I get one, it will be just that much better.” Of course one can never tell, but I still have hopes of getting a pass before crossing the pond. I sure would like to be home on your birthday. Say, the news from the front sounds good whether it is true or not. I think we will get a chance at the finish yet tho. Yesterday they issued metal caps to put on the peak of our tents so if it should rain, it would not be quite so bad as it was. Don’t worry a minute about my getting sick because I take as good care of myself as I can & if the men in my tent keep well, I ought to get by alright. I reassure my mother that I'm too thrifty to spend as much as 10 cents on a candy bar very often. I got the package today containing the leggings and my pen. It sure seems good to be able to write with a pen once more. I got your package yesterday with the writing paper and candy. Believe me, the candy was sure appreciated. Now that the canteen is quarantined, men go down there and buy chocolate bars and peddle them in camp for 10 cents apiece but I don’t patronize them very much because it is a holdup [at that price]. I never was so crazy for candy. I didn’t eat much at home but I had honey and jelly, etc. [to satisfy my sweet tooth]. You didn’t need to send me so much money but if we aren’t paid before long, I will have to break into it. If we do get paid, I will send it back. I spend most of my money on stamps. I wonder whose [corn] binder Willis is using. Whose ever it is, I’ll bet he’s having an awful time. I don’t see how the people on College Hill could pull off a doings like Mr. Hays’ sale without someone getting sore. It is human nature. Tell Carol to keep on getting good grades and I will get her something when I get a chance. Tell her to write me another letter. That man who is married and bunks with me got a pass to Manhattan Saturday night and had his wife come up from Wamego [KS]. He sure was homesick but he came home happy. He said it cost him $25 but he didn’t care a bit. Say Bill [Willis], I’ll bet you a dollar I’ll get to help you shuck corn next fall. Have you learned anything more about what Niehenke is going to do with his place? This has been the strangest Sunday I have spent since I came to camp. Nobody to be seen around the Hostess House. A good many cases [of influenza] go out of here everyday and I am afraid it is fixing to rain. If it does, it will be bad but if the weather stayed like today, I believe the epidemic would run its course in about a week. You should have seen the hill behind the camp today. Every man had to take his bed clothes out and spread them out in the sun on the hill. They made the hill look like a great huge patch work quilt. Well there isn’t much news. It’s the same old drag. I am well so far and expect to get a pass sometime. Louis Niehenke, born about 1866, had a farm north of the Griffing's on College Hill. The Griffing's never purchased the farm but they did "farm" it for many years in the 1920's and 30's. Minnie tells me she is disappointed no opportunity arose for us get together on Sunday but she enjoyed a visit with my mother nonetheless. Well, I’m back to my school again without a very exciting weekend. Friday night I went down to Strong school house [because] they had a program. Rev. McClelland and his son, Capt. McClelland, both gave a talk. It was good. Saturday evening I went over to see your mother. I guess we staid pretty late. [My sister] Bertha, Papa, and [my brother] Wayne went to the [picture] show downtown. This morning I went to church. When I came home I called your mother and asked if she didn’t want to go for a ride. She said yes, so we went over and got Carol [Cunningham] and her and brought them with us when we came up here. I knew she would be awfully lonesome and she felt bad because you couldn’t come home. I thought it would take her mind off of it some maybe. [Your brother] Willis went downtown this afternoon to take some films so she was alone. Everett Wayne Frey was one of Minnie’s younger brothers. Wayne was born 29 October 1905. Minnie writes me from her parent’s home in Manhattan and reminisces about earlier times. Well I’m home. The folks -- Papa & [my sister] Bertha – came up about 3:30 yesterday and visited my school. I was glad to see them. We were so tickled coming home. We noticed once the horn honked when Papa didn’t make it. We went about a mile further and the old thing began to honk and it just kept honking. Papa couldn’t stop it at all. He stopped the car and kept pulling on the button but it kept on honking. Well Bertha and I were just doubled up with laughing. Papa ... got just as red as a beet. He finally got out and [found that] the wire was grounded. We had 3 people following us wondering what was up. I just now went out to see an airoplane sailing over. It looked so bright and pretty. Bertha is going to leave here in two weeks. [Her husband] Charlie [Scholer] has a place [in Washington, D.C. where he works for the War Department] – 2 rooms and porch. [They] have to pay $55 [per month] but it’s very nice, Charlie says. It’s certainly too bad that you are quarantined... I feel awfully sorry for you boy, but that doesn’t do you any good. I wish I could do something that would. If I could come over to see you, it would be some better but of course they won’t let me go now. Just remember, Ward, that you will be on my mind every minute tomorrow. I’ll not be away from you in thoughts. I never am, for I am waiting for a real man. My, but I am proud of you. A girl just can’t help but try to live up to the finest that is in her when she has a lover like you, Ward. When this war is over, I’ll work all my life to try to prove to you how much I love and respect you. Not in words but in actions. I told you in my last letter I wasn’t going to look for you any more – but I am. I’m going to plan and look for you home – until you do come. I know it will be soon Ward. I got to telling Bertha and Mama this morning when we were sitting on the front porch how you hated the squeak of that porch swing. I said I was going to oil it before you came home. Mama got up, went out and got oil, came back and oiled it. It had its effect. It doesn’t squeak anymore. I had a letter from you yesterday. Maybe you think it wasn’t welcomed? I’d given anything if I had come home last Sunday and we had gone over in the evening and brought you home with us. If I could only be home here, I’ll bet there wouldn’t be an opportunity pass by for getting you home or my going over, between your folks and mine. I’d sure be there. All the boys came in and I had to stop to help them sing, “Keep the Home Fires Burning.” Bertha’s playing the piano – it’s the first chance we’ve all had to sing together for a long time. I’m going to get “There’s a Long, Long Trail.” I’m sure crazy about that [song]. Remember one evening you and I sat out here on the porch railing and sang that? I wish I could hear you sing it now. I will someday tho, and I will play it for you too. I am sure going to take music lessons and practice hard next summer because I believe it would please you if I could learn to play – and I would do anything that would do that. I’m going over to see your mother this evening, I guess. Maybe not till tomorrow but I’ll go sometime before I go back to school. Charlie [Scholer] says it looks like now the war will be over before the end of the year even. We would like to know whether that is his own opinion or if he had some inside information. It can’t be over too soon, it’s time the poor boys are coming home. The casualty list is growing – a long list of Kansas boys are named everyday now. It just scares me. The worst fighting has been done since these lists have been out too. The Kansas and Missouri boys are just getting into it now. I wish, boy, I could walk shoulder to shoulder with you all thru this, but I’m with you just the same. Well, if the quarantine should be lifted by any streak of luck, I’ll get to see you. I wish you would call up. I’m worried about that sore throat you had. I wouldn’t have you get that disease for anything. Two boys from up Sherman [Township] were brought home to be buried yesterday – one from Camp Funston, another from a camp in the East. I write Minnie more news about camp life, circling airplanes, and the flu epidemic. Well this is Saturday morning & it sure is a beautiful day. I expect you are home & enjoying your visit but I am still under quarantine & there is no telling when I can get out. My, how I wish I could go home tonight. Yesterday was an awful day. I believe it was the worst for wind & dirt we have had. A bunch of men is taken out of this company every day with influenza but I don’t believe any have died from this company. Health orders are very strict. We have to sleep with our tent walls rolled up & the canteen is closed to avoid crowds. Married men whose wives are in Manhattan or Junction City [are the only ones who] can get passes. Some of the boys wish they were married now. Tomorrow will sure be a lonesome day. Last Sunday I had hopes of seeing someone but this time I haven’t even any hopes. I got your box of candy alright & it sure was fine. I didn’t eat much candy in civil life but I always had honey, jelly, syrup etc. for sweets. But here we don’t get hardly any of that kind & all of us crave for something sweet. I expect sugar is hard to get now at home tho. Every once in awhile we can hear a roar & look up & see an airplane. We have seen four in the air at one time over camp. The other night one lit just west of camp & then flew over pretty low & we sure got a good view of it. It was a great big thing & made an awful roar. I was moved into another tent the other night & do you know I got sort of homesick? We had gotten so used to that tent that it seemed like home. But our new tent is a better tent, although there is no place to put up a stove. I trust we will be out of here before cold weather tho. I would rather be moved across right away than to have to stay in this place all winter. The new “Y” [YMCA] is almost done now so maybe we can have better writing accommodations soon. I suppose you won’t care if we do, will you? My squad is on fire guard again but it won’t stop our visiting today I guess with this beastly quarantine on. The 10th Division hasn’t moved out yet so we can’t tell whether we will be attached to it or to a new division. The news from the front is sure encouraging, but just the same I would like to take the trip across [to Europe]. I would like to get back in time to go to school [at the Kansas State Agricultural College] next fall. You are still planning to go, I suppose. Say, there is one thing I won’t kick on when I get home & that is grub. I will have the innards of a mule when I get out of this army. At home, if I didn’t like a thing, I wouldn’t eat it but now the only thing I worry about is the quantity. Everything is inspection up here on Saturday. [There is] inspection of arms, then bunk & equipment inspection, inspection of quarters, & foot inspection. I washed some of my clothes yesterday but it sure is a hard job to get them clean after living out in this awful dirt with no hot water too. We have got to scrub our tents out with creosote today. Don’t you pity our noses? I tell my mother and brother Willis about camp life, give Willis some gratuitous advice about the farm, and update them on the quarantine in effect at Fort Riley and the adjoining camps. My squad is on detail as the barracks squad today and as we are thru with our work, I can wash and write. A barracks squad is left at camp each day to police up and do odd jobs around. They take turns at it. I got your letters and the money and stamps but the leggings haven’t come yet. I may get them tonight. I got the posts the other day. Your letters sure seemed like home this time, especially Willis’ telling about the crops, cattle and other things. I am sure glad you were able to pick up those calves there at home without having to go to Kansas City. Be careful and don’t sell too short of feed. I hope Bonine is well by this time. I sure would like to get home once to see those calves and your crop of [winter] wheat. I’ll bet it looks fine. It sure is fine that you [Willis] can be with the Sig Alpha [Fraternity] because I guess they are about the nicest Frat bunch in school. I sure wish I could too. My, but I sure would like to run the car just once more. Is McCormick back in school this year? The wind and dirt today is something awful. We never had it so bad as this back home. The reason is that the land is inclined to be sandy and the grass is skinned off of lots of it. If a person washes and hangs out his clothes, they soon get covered with dirt, but if they are dirty on Saturday morning inspection, it’s the rock pile or K.P. If we ever get out of this camp and into barracks, it won’t be so bad. I would rather be sent right to France than to be kept in this hole all winter. We were called out just a little while ago because of fire but they didn’t need us. There was a fire up on the hill back of camp but the men around it put it out. If a fire should get started in camp on a day like this, there wouldn’t be a tent stake sticking out of the ground. A bunch of men is taken out of camp every day but I don’t think many deaths have occurred yet. They make us sleep every night with the walls of our tents rolled up so as to have lots of fresh air and I go down to get my throat sprayed as often as I can. We can’t go down to the canteen anymore because they don’t want crowds. I thot by the time I wrote another letter, I would have some news but it is the same old thing. I guess I didn’t tell you I was on the main guard Monday and Tuesday. Those who knew their general orders were put on guard and they were to be the only ones issued passes. We were tickled about it but that night while we were on guard, the order came to not let anyone in or out of camp without a special pass. During the day, visitors would stop to see their boys in camp and it sure was hard to turn them down. Sometimes they would let a man go to the road, say hello to his girl, kiss her and say goodbye. And if he was lucky enough, he might talk about a minute. Minnie writes me that she hopes the quarantine will be lifted soon so she can visit Camp Funston. I sure am feeling blue tonight here. I have just been carried away with expectations for this weekend. The first blow came this noon. I was sure expecting a letter from you, and the mail man always comes before or at noon. Well today he didn’t come till about two o’clock. Then I sent one of the boys out just a hiking. I couldn’t hardly teach I was so anxious for that mail man to come. Then Ora [Condry] came in empty handed. Well, I began to think then that maybe you were quarantined, you having said what you did in your last letter. Tonight when I came home, I grabbed the paper and there it said that married men were coming to Manhattan just the same, but single men could not leave camp or visitors were not allowed at camp. I don’t see why they won’t let boys that live at Manhattan come just the same as married men – it’s all the same if they go right to their homes. I’m just hoping and praying that by Sunday the quarantine will be lifted. That’s my only hope now. If I’m disappointed this time, I’m not going to look for you any more, if I can help it. I want to just try to give it up. If you do get to come all right, I’ll be mighty glad. If you don’t, why it will be just what I expected and I won’t feel so bad, but I’m going to try not to plan on it anymore. I didn’t even hear from the folks. I sent for two books for the fifth grade and we thought they would come yesterday, and today I was sure they would come but didn’t even get a letter from the folks saying why they didn’t send them. They are the classics books that are just out and we have to get them in Manhattan. I wrote Monday and told the folks to send them. They can do that alright. But I don’t understand at all why I haven’t heard. We are going to have a genuine cleaning at school house tomorrow evening. A couple of the children are going to stay and help me mop the floor – it gets so dreadfully dusty even if I do sweep it good every night. I had the awfullest dream last night about you. I don’t see what made me dream it unless I ate too much meat for supper. I’ll not write it -- it’s too gruesome (I don’t know how to spell that [word] but I guess you can sound it out and you’ll know what I meant for it). Ward, if you aren’t too busy, won’t you write? Even if you can’t send letters to me now, then send them all together when the quarantine is lifted? I sure wish you would if you can. The papers sure sound good about the war over there. Turkey, I guess, will give it up pretty soon now, and the Yanks are sure driving in fast on all the western fronts. The Germans can’t hold them at all anywhere. I’m sure mighty happy over the way things are going. Friday noon: The mail man hasn’t come yet so I thought I would just add a little. It’s just awfully windy today. I bet it blows up a rain. I don’t know whether the folks will risk coming for me or not. I won’t care so awfully much if they don’t. I won’t be able to see you and I would miss you more at home than I would up here. Then I would like to go over to Grand View tonight. There’s a bunch of kids up here that go over to Camp Funston about twice a week to see Clint Scott. I’m anxious to get acquainted with them and maybe they’ll ask me to go along if they find out I have a friend over there. I sure hope you’ll get to stay at Camp Funston. I bet you’ll be lonesome, boy. You’re probably getting pretty tired of that camp. I’m sure sorry you can’t come home Sunday. – M. G. F.
Minnie writes me about some of her students bringing water to school because they don’t trust the well water. I didn’t hear from you today. Maybe I will tomorrow, I haven’t seen anything in the paper about the Camp being quarantined. You seem to think lately that once a week is often enough to write me, don’t you? It was a week ago tomorrow evening that you wrote to me last. It looked rather cloudy this afternoon and sprinkled a little. I’m afraid it will rain Friday and I’m sure planning on getting home and seeing you too. Ward, do you still have those seeds in small bottles? I have time now and have things started well enough so I can fix that up now. I don’t have to teach agriculture, but I am supposed to teach some nature study for the whole school. I believe I have a pretty good plan that will be of interest to the children and me too. Three of the Klein children brought a little bucket of water from home to drink today. They don’t think the water at school house is good. I can’t for the life of me see anything wrong with the water up there. I think they are trying to work up a little excitement again. The Klein children didn’t bring their 25 cents apiece for the Red Cross. I asked Zelphia when she was going to bring it and she said it was hard to tell and then laughed. So I suppose I’ll have to pay for them. I don’t want to but they are awfully poor so I expect I’ll half to pay it. I’m dizzy headed tonight. It was so warm and nice after supper, I went out and sat in the porch swing and kept it going. I haven’t been swinging in one for so long that it made me dizzy and I still feel it. I’m sure anxious to see you Sunday. I hope you won’t have to drill or anything so you can come home. I don’t feel now like I did when you first went in. I’m getting used to it and don’t care so much as long as you are well and alright. At first I just thought I couldn’t stand it. I kept thinking, even if I did try not to, that maybe you wouldn’t come back and I don’t think that at all now. I just feel sure that God will keep care of you and bring you back safe. So why should I make myself miserable. I felt like a funeral for awhile and ten years older than I am. Everything seemed gloomy. It will seem like an awfully long time till you get to come home again to stay, but I ought to be able to stand that if you just get back alright. I wish Kate could feel about [her boyfriend's] going over there [to Europe] and coming back the way I do about you. I believe she would be lots happier than she is. Maybe she thinks she has to stew around like that to let people know how much she cares for him. But I don’t believe she would. It doesn’t seem as if she thinks of any power greater than earthly power will bring him home. I wouldn’t want to tell others because they might feel lots worse if I didn’t just put all my trust in God. 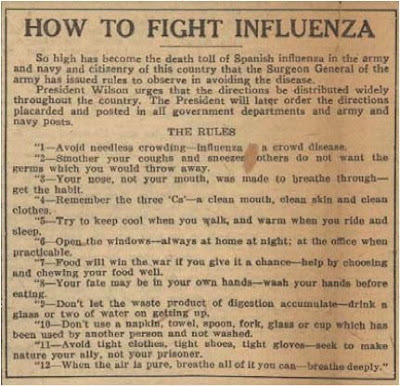 I read in tonight’s paper that there are eleven hundred cases of that influenza at Camp Funston. It certainly seems to be spreading. Only one more letter to write, then I’ll be at home. My, I do hope you will get to come over. If you can’t get off during the day, can’t you come Saturday or Sunday evening? I wouldn’t be there Sunday evening tho unless I knew you were coming, then I would stay and come up Monday morning. You are certainly getting a long stay at the Detention Camp – longer than I’ve ever known any of the boys to stay that are well. But I guess it’s a good thing while that disease is so bad at Camp Funston. P.S. Sure planning on seeing you now mighty soon. And I hope there’s not anymore disappointments in store for us. Minnie writes me second hand news received from her sister Bertha Scholer. Well I couldn’t think of a thing to write you last evening so I decided to wait till this morning. Isn’t this the beginning of the finest day you’ve ever seen? It’s just grand up here. Time for half past eight bell. The bell is turned over and it sounds just awful. At last I’m able to tell Floyd [Krause] from [his identical twin brother] Lloyd. I can’t tell you what difference there is but when they come up to recite, I can generally tell one from the other now. Had a letter from [my sister] Bertha yesterday but none from you. Bertha said your folks were disappointed all around. They had their [picnic] dinner all ready [to take to Camp Funston] and when they got downtown, Spark’s girl [said she] thought you were going to come down, so they went back home. My, wouldn’t I have been jumping around some if I had been home. Why I would have been tickled to death, and then you couldn’t [come home]. That was sure too bad. But now I’m planning for next Sunday. Bertha said she expected to visit my school soon – probably Friday afternoon – so I know that means that they expect to come for me. Oh, if this weather can only last. And most of all, if you can only come home. It will be next to heaven. My, it’s been a long time since I’ve seen you, dear boy. Kids are coming so I must end this soon. Old Kaiser Bill says he just realizes that he may not win this war. Too bad he’s been so sleepy. German Emperor Wilhelm II (27 January 1859 – 4 June 1941) was the last German Emperor (Kaiser) and the last King of Prussia, ruling from 15 June 1888 to 9 November 1918. His common appellation in the U.S. was "Old Kaiser Bill." 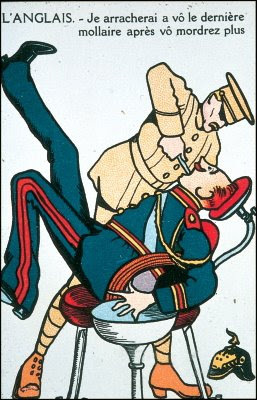 Loosely translated: I'll pull out your last tooth so you can't bite anymore. I write Minnie about my failed attempt to get a weekend pass. Since some of this is the same material I wrote to my mother a couple of days earlier, I'll not repeat it here. You can never imagine how I wanted to come home & how I felt after all those disappointments. If I hadn’t been a soldier, maybe I would have bawled. I know I felt like it. As it turned out, I guess it was a good thing I didn’t go even if I don’t get home until Christmas. For one reason, I would not have seen you & you were the one I wanted to see. We drilled pretty hard yesterday & with no sleep & the way I felt it would have been hard to top all that. Our company had to furnish the main guard for the camp for the 24 hours beginning 5 o’clock Monday P. M. Yesterday the company commander chose the guard by having all those who had learned their general orders to step forward. About 1/6 of the company had learned them & he said that they would be the only ones to receive weekend passes this week. Well I was sure glad I had learned them because I would walk guard all night in order to come home. Well we went on guard & believe me, it was mighty little sleep we got last night. It was cold & raw too down there by the [Republican] river where the post was. I wore my sweater, two shirts, my blouse & my raincoat & that was none too much. If it hadn’t been for you sweetheart, that would have been a lonely old post but I just kept thinking about you and about the things we had done together & above all, the things that I hope we will do together in the future. After this old fuss is over & I get back, I hope that you & I, Minnie, will fall out at reveille and march shoulder to shoulder through to the end of the day until retreat sounds in the evening. We will then salute Old Glory together & thank God that we had known & loved each other forever & always. While we were on guard last night, the order came out that the camp was under quarantine & to allow no one to leave or enter the camp without a special pass. Well that sure was the climax. After going on guard under the belief that we would be issued passes & then quarantine us! I don’t know how long the quarantine will last but I sure hope it is lifted by Saturday. Several men were taken out of our company to the base hospital because of the influenza but don’t you worry about my getting it. I don’t believe it is so very dangerous anyway. I got a sore throat on guard but I went over to the infirmary & got my throat sprayed & it feels a little better now. I hope I can get it sprayed everyday. Minnie writes me to say she is encouraged by the war news from Europe but worried about the flu epidemic at Camp Funston. Had a letter from you today -- was sure glad to get it. It’s been a week since I’ve heard from you. I should have gotten it Saturday. You had Route 8 written on it. I expect you were writing to your folks and then put the same route on mine as you did on theirs. You don’t want to do that anymore or I may not get your letters. Did you try to get a pass for Sunday or are you quarantined? I didn’t know before you couldn’t write if you were quarantined over there. School is going fine. It’s pretty cold up there this kind of weather. Part of a window light is out of one window and one window is out of place and wind just whistles in all around. We must have it fixed before real cold weather or we’ll burn a lot of coal for nothing. I heard they had another big rain at Camp Funston and I thought of you over there in that leaky tent. I guess you are getting used to it now tho. It would be awful if you were to get that influenza and had to be in that kind of place. I sure hope you do keep well but I’m afraid of that epidemic that’s broken out. Maybe you think I don’t want you to be quarantined if it’s going to interfere with your getting a pass. I’ve actually planned on you getting one some time soon until it would be an awful disappointment if you didn’t. And I’ll bet it seems ages to you since you have been home. It seems like a long time to me when I’m just gone over Sunday. The papers sure sound good, boy. This has been the best week they have ever had [in Europe]. That is more to show for it. One of the boys up here that’s now in France belongs to the Coast Artillery and he said from the news he heard it sure sounds fine. Said he probably would be home Xmas. But I don’t believe the last at all. Write whenever you can, boy, even if you don’t have any news. I don’t have either. And it makes the day so much pleasanter when I hear from you. Pen’s dry. On September 26th, the American forces under General Pershing began the great Meuse-Argonne offensive, with the specific object of breaking through the Hindenburg line and the Argonne forest defenses in order to cut the vitally important railroad communications of the German armies through Mézières and Sedan. On the first day the Americans drove through the barbed wire entanglements and mastered all the first line defenses. During the next couple of days, Americans on the Meuse-Argonne front penetrated heavily fortified German lines to a depth of from 3 to 7 miles, capturing 10,000 prisoners. The Coast Artillery Corps was primarily stationed along the coast and at out posts of our foreign territories. Coast Artillery installations were mostly harbor defenses and were stationed at a fort or fortified gun emplacements. At the time of our entry into WWI, America was ill prepared for large scale warfare with large movements of whole armies. The U.S. Army was not prepared with its Artillery and had no heavy artillery guns to speak of. When the Coast Artillery finally went to France they used French or British made weapons. The Coast Artillery corps played a major role in gaining the upper hand in the quagmire that was going on in Europe. If it was not for the efforts of the Coast Artillery Corps many more human lives would have been devoured in the battlefields of that war. These photographs were taken by Lew Griffing as U.S. troops were being loaded for transport to France and while enroute on the high seas. My mother writes me to let me know she was disappointed that I didn't make it home for a visit. She also tells me about the family and says she received a letter with pictures from my older cousin Lew Griffing in France. My! It’s cold tonight. I hope you will be able to keep warm. These days make one begin to think that winter will soon be upon us. I wonder if yesterday was as full of hopes and disappointments for you as it was for me. When your letter came Saturday morning, I thot that likely you could be home. Then about 3 [o’clock], Miss [Alice] Bobeck [Bobek] phoned me that you boys could not get a pass to leave camp on account of the disease but that visitors cold still go there. So then I planned that we would go up to see you. Bertha [Scholer] had called me up & said Minnie had not come home but if I learned that you would be home that they would go after her. So when we thot we would go up I called them but Mrs. Frey thot that she had school work to do and had better not come this time. Well, Sunday morning I hustled and got a good lunch put up. I was going to try to get the chicken & gravy & sweet potatoes up there warm by putting them in the hot bean pot, &c. [Your brother] Willis went up & got Kate. We left home 10:25 [A. M.], got to town for Miss Alice and she said that you were going to have a pass. So we thot if you got the pass, you could come down on the interurban and we not make the trip. We came back – Kate stayed – I did up the work I had gone off and left, then we had our picnic dinner and after the work was done up, Kate & I visited & waited for you. Willis took a nap. Kate went over to Munger’s, then to Sunday School. After Sunday School, George, Kate, Stella, & Brownie all came over [here] to see you. I had called up Alice & she said she had not expected you until after 5 [o’clock]. So I still hoped you would come & so the day went. Mr. [James] Sparks called about 7:30 [P. M.] and told why you had not come. I hope your head was alright this morning. Aunt Mate & Uncle Lloyd [Fry] were here yesterday about night and Mr. & Mrs. Frey & Bertha [Scholer] came around on their way home after taking the milk last night to learn how we found you, etc. You may be sure that you have lots of friends around here. By the way, people are always asking us how you are getting along. Minnie called up from Riley yesterday morning to know your address for she supposed you had been moved. I expect you will enjoy the box of candy that you will get. I started with a jar of strawberry jam & some jelly to leave for you yesterday. Willis thot I should not have bothered Mr. Sparkes to have taken that bundle. I suppose you understood that the mess of little rags were for cleaning your gun. Mate was here when I did them up. I felt that maybe it was making too large a bundle to put them in [but] she said, “Oh! he will get his share of them.” The wristlets Mrs. Frey knitted. She did not know that they make them to come up on the hand. I shall try to knit you some of them after I finish the helmet. Aunt Mate knitted one pair of socks & I the other. A good long letter came from [your cousin] Lew [Griffing] today. Willis has finished the wheat, plowed out the potatoes and tomorrow expects to begin cutting the cafir & cane. Willis went down to spend the evening with that Mr. Fisher last week, then on Friday night they took some girls to the [picture] show and he stayed all night with the boys at the [fraternity] house. This afternoon they called up & asked him down for tonight. It is the last night before they go into the service &c. so they are having a “Big day tonight.” I hope they are the right sort of men for he seems quite taken up with them. I am glad for him to have someone that way if they are only the right kind. He thinks they are. If he goes there so much, we will have to have them out here some time. Carol [Cunningham] was much pleased with her letter you wrote her. She brot her book home tonight and “studied” tonight. Willis received a letter from Ethel Arnold the other day. If there is anything you want that I can send you to make things any better, do let me know. I hope you will keep well. Things never seem so hard if one can only keep well. The interest on the bonds came a while ago. We have not cashed them yet – 75 cents each. I asked at the bank the other day about Fitzgerald – he had put in $20. Didn’t that surprise you? So that will make him straight now. I expect she will be asking for the papering, etc. soon. Hattie doesn't say how cold it was but according to historical records kept between 1891 and 2006, September 1918 was the second coldest September in Manhattan, Kansas, coming in at 63.3 degrees Farenheit (on average). The nights must have been pretty chilly in tents out on the prairie. Lewellen ["Lew"] Goodrich Griffing was the 29 year-old bachelor son of John Silas Griffing and a cousin of Ward's. Lew was inducted into the army during WWI and served in France. His draft registration card indicates that he was employed as a farmer on his father’s dairy farm near Tecumseh, Kansas prior to entering the service and that he was of medium height, stocky build, and had blue eyes and black hair. Ethel Arnold was the 21 year-old daughter of 57 year-old Lewis D. Arnold and his 43 year-old wife Emma. In 1918, Ethel Arnold (like Minnie) also worked as a school teacher in Riley County. Ethel’s siblings included 15 year-old sister Leah, and four brothers: 19 year-old Ross, 17 year-old Alfred, 12 year-old Harold, and 5 year-old Ralph. Sometime after 1930, Ethel Arnold and Willis Griffing were engaged to be married several years later, but Ethel died prior to the wedding. Family tradition has it that she collapsed in a dental office and never regained consciousness. A local paper says the cause of death was a "weak heart." Willis was devastated and never married. I write my mother to tell her about my failed attempt to get a pass and make a visit home. I also let her know that Camp Republican isn't yet under quarantine due to the Spanish influenza. Yesterday & today has sure been a series of disappointments for me & some of the other boys too. About the middle of the week it looked as tho we might still be here Saturday so we counted on getting passes. Saturday afternoon an order was posted that no weekend passes would be granted on account of the influenza. Well, Saturday evening we learned that that order had been revoked but they didn’t tell us because passes must be applied for before eight o’clock A.M. We thot then that we would be the first to get in our names for passes on Sunday, so Roy [Drown] and I went down there before the top sergeant was dressed & put in our names. He put down our names for from reveille on Sunday to reveille on Monday. So we sure were tickled. Our passes didn’t get thru right away so we thot we would have to wait till noon. So [James] Sparks & I went to the [Post] Exchange to phone. I thot if you folks could, you might drive up [from Manhattan] at noon & I could ride back with you & come back at night. I couldn’t get you folks but Sparks got [his girlfriend] Alice [Bobeck] & told her he was coming in & for her not to come up. She said that you folks were coming up at 10:30 so we were tickled again. Pretty soon we learned that no passes would be issued till after 5 o’clock because every man had to be in a parade in the P.M. Well, I thot if you folks came up, I would ride back with you anyway. I would be at home 4 or 5 hours. Well, I got my pass after the parade & went down to the road & saw that you hadn’t come so that I had better not try to go home. I guess it is a good thing I didn’t because I don’t feel very well. I guess my last vaccination is taking. It is beginning to get red, and if I staid up almost all night I couldn’t stand the drill Monday. I hoped that you folks would do like Conrows did. They came in the morning, staid all day & took the boys home this evening & will bring them back before six o’clock in the morning. Of course the stay at home is so short, it hardly pays for the trouble. Some of the boys who lived in [Manhattan] went in but I thot that by the time I would walk out home [to College Hill] or wait for you to come after me, it wouldn’t pay. And besides, I didn’t want to bother Willis in the morning because he is so busy. It is hard to tell when I will leave this camp. It may be tomorrow or it may be a week. I may get a pass & I may not so I wish you would send me my leggings that I had in drill. I thot I could get them today but I didn’t. You might send my fountain pen also. I am pretty short on money & I am out of stamps but maybe we will be paid this week sometime. How are all you folks and all the neighbors? I haven’t heard hardly a thing about College Hill since I have been up here. It sure made me sore to have a pass to go home & then not get there. No telling when I may get another. How is Carol [Cunningham] getting along in school? Is Willis getting the work caught up? The camp isn’t under quarantine so maybe we will be moved some time this week. There is some talk that the 10th Division is full & that we will be put into a new division at Funston but that is only talk & there is still a chance of our being sent with the 10th when it starts to move the first of the month. Willis, are you thinking of buying any cattle or are you going to sell the ensilage? I sure hope I can help fill the silo next fall. It would seem like heaven to get a chance at it again. James Sparks was born 21 February 1897 in Medicine Lodge, Kansas. His parents were G.C. 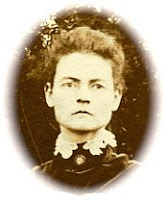 and Myrtle Sparks, born about 1872 and 1871, respectively. James' father was the manager of a restaurant in Manhattan, Kansas. At the time that James registrated with the draft board in the Spring of 1918, he was a student at KSAC in Manhattan. His draft registration papers report that he had blue eyes and light brown hair. His girlfriend, also a student at KSAC, was named Alice Bobeck. James and Alice were married in 1920 following the war and by 1930 they lived in Lawton, Commanche County, Oklahoma, had two children, and James worked as the County Superintendent. Minnie tells me about giving exams to her students. Also describes a “typical day” as a school teacher, gets angry at a student in class, and laments that her students can’t remember all that she has taught them. I received a letter from you and Mama today. I was sure glad to get them. We had five exams today [and we are] going to have twelve tomorrow. I like examination days, only I was so disappointed in some of the papers I graded tonight. Some of the things I just drilled and drilled them on I got the awfulest answers for. It sure isn’t encouraging. I wanted to grade all the papers at the school house tonight before I came home. I was grading away and was on my last paper when I looked up at the clock and saw it was fifteen minutes of six. We have supper at six, and I had the school house to sweep and the boards to erase before I could go home. I sure pitched in and broke my record for sweeping. It took me three minutes to sweep the school room – and you could tell it had been too – when I got thru. Believe me, I did some jumping. I looked at the clock just as I shut the door to come home and it was 10 minutes of six. So it took me 5 minutes to do my work. You sure can do a lot in a little time if it’s necessary. I got my supper all right. I have to keep about as regular hours as you do, Ward. I don’t believe I’ve ever told you how my days planned out. I wouldn’t know it if I did [since I’m] writing every day and I can never hardly remember what I have written the day before. Mrs. Parkerson gets up at six o’clock. About 6:30 she calls, “Breakfast will be ready.” I get up then and dress and go down for breakfast. At 7:30 we eat, then Mr. Parkerson reads from the Bible and then we all kneel and have prayer. It is then generally about 20 minutes of eight. I go to my room, make my bed, straighten up my room, put the finishing touches on myself, collect my books and address a letter to Ward (if I hadn’t the night before), [and] then it is about 8:15. I go to school, mail the letter on my way, get to school about two minutes before time to ring the half past eight bell, etc. in the evening I have to be home in time to wash and get ready for 6 o’clock supper. [Then I] talk to Mrs. Parkerson from one to two to three hours, go to my room, write about an hour, tinker around about half an hour, give W. C. G.’s picture one farewell glance, say my prayers and go to bed. This I do day after day hardly varying at all. I’m so lonesome tonight I feel like screaming. I’m sure I don’t know why I should be so much more than common. I believe you must be thinking of me tonight, I have seen two cars go by. I just feel like going out and hailing them. I want to go some place or do something so bad. I think one reason is that always before at end of week, I’m planning great on seeing you. Tomorrow is Friday and I have no such plans for this weekend. My, but I wish I could. Just think what it will be like this winter just week after week. I’ll just half to sit up here, snow so deep I can’t even get home [and with] you so far off that I can hardly make myself believe that you are [real] and wondering if you really did ever exist or if I’ve just been dreaming. My, I don’t like to think of what’s before me. But believe me, boy, this is going to be a long old Saturday and Sunday. Gee! (excuse the slang) but I do wish I could see you. It seems as if I want to worse than ever it that’s possible. But I guess it’s like you say, if last Sunday was the last, it was the last and that’s all there is to it. I sure hope you get to stay at Camp Funston quite a spell. Maybe I’d get a peep at you once in awhile. My! if about Saturday or Sunday you would come driving in, I think I would be the happiest piece of humanity you’ve ever seen. I don’t see why something like that can’t happen. I read in tonight’s paper where one of the boys in your division left for a camp in Montana. Now there’s no sense in them sending you off some place like that when you might just as well be here. Looks like they would know that. Mama said in her letter today that she didn’t think I would get home for a couple of weeks. I got real fierce in school today. Little Cecil Klein reached across the aisle and kept sticking Glen Wickstrum with a darning needle. Glen told me. I told Cecil to put his needle away, then to go up and sit on the floor behind the oil stove. [I told him] if he couldn’t leave others alone when he was at his seat, he could go where he couldn’t torment anyone else. Well that little skunk went up there and just stood. I told him to sit down. He didn’t do it. Then says I, “Cecil, can you hear what I say?” He shook his head that he couldn’t. I yelled it out again, “Sit down!” he wouldn’t do it. Well, it made me just stew to think that he would refuse to mind me. I went over there and he sat down alright and got up and sat down several times faster than he could ever have done it alone. Then I spanked him good and hard. I was just trembling I was so mad, but I’ll bet that kid never refuses to mind again. He cried for about two hours. It did him good tho and didn’t hurt him abit. The boys brought a ladder up and a couple of fishing poles and we put the new rope thru the loop on the flag pole on top of the belfry. So we had the flag up on the school house this afternoon. I just finished reading “The Adventures of Deer Slayer” in school yesterday. It is cut down from the regular novel on purpose for school children. It sure was interesting . Today I began reading “Oliver Twist and David Copperfield.” It is also a small book cut down for children. They were some Miss Holtman sent for and they just came about a week ago. One of the geography questions today was: “What is the Weather Bureau and tell of its work.” Mabel wrote: “It is a machine that can tell what the weather will be.” In the same question: “Define Isothermal Lines.” Lloyd [Krause] had, “Lines that divide states, also river and mountains.” I get some of the most senseless answers. I don’t see why either because they all understand it when we go over it. If they don’t when they come to class, we talk about it until they do. Some of them remember and give good answers; others are terrible. Mrs. Parkerson is knitting some socks for Clinton Scott – a boy who lives right near hear, or rather his folks do. They live in the first house south of school house. I don’t know whether you would remember or not, it’s the place where the folks thought maybe I could get room if I couldn’t get here. Well he is at Camp Funston and he expects to leave for Siberia right soon. Mrs. Scott and Mrs. Parkerson are both knitting a pair for him and I never saw such heavy things in all my life. I’ll bet they will stand alone when they are finished. But they are sure just the thing for him. If I go to church with Parkerson’s Sunday, I expect I’ll get to meet what young folks there are up here. I guess there’s not more than 3 or 4. The girls up here marry between fourteen and eighteen years of age and the boys between sixteen and twenty-one. So there’s nothing but married people. I’ll be the first teacher they have had for years that hasn’t captured some fellow to go with while here. The teach last met “The Man” while up here. He’s in France now tho. My, but I wish I would hurry up and hear where you are. Not but what I think you’ll write when you can and all that, but am just curious and very anxious. Mr. Parkerson told me last night he wouldn’t be surprised if they would come to some understanding before snow flew. I only wish he knew what he was talking about. Cecil Klein was the four year-old younger brother of Zelphie Klein, children of Ross and Jadie Klein of Grant Township, Riley County, Kansas. Glen Wickstrum was the seven year-old son of 45 year-old Swede farmer Charles O. Wickstrum and his 37 year-old wife Nancy, of Sherman Township, Riley County, Kansas. Probably Mrs. Marina Holtman, the 21 year-old wife of 28 year-old John Herbert Holtman who was a farmer in Sherman Township, Riley County, Kansas. According to his draft registration papers, John H. Holtman was born on 11 April 1889 in Kansas. He was described as tall and slim, with blue eyes and brown hair. His parents were both born in Sweden. Clinton T. Scott was the 24 year-old son of 60 year-old farmer William L. Scott and his 57 year-old wife Netta who lived in Sherman Township, Riley County, Kansas. Clinton would survive the war, marry Alice Busher around 1921, and resume farming in Sherman Township. By 1930, he and Alice had two daughters, named Marie and Betty.